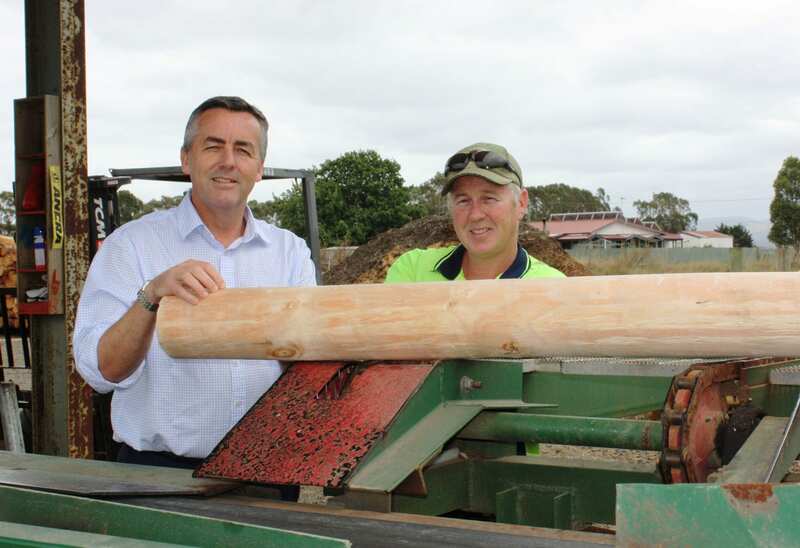 Federal Member for Gippsland Darren Chester pictured with Alberton Timber and Treatment Plant owner Luke Olarenshaw. The business has received Federal Government funding to double current production. A new steam cylinder has arrived at Alberton Timber and Treatment Plant, following Federal Government funding of $550,000 to expand the business. The Nationals Member for Gippsland Darren Chester said the family-owned business was constructing a new post peeling facility to boost efficiency and reliability. “The new post peeling facility will help Alberton Timber and Treatment Plant reinforce its place as one of the main suppliers of treated pine products in Gippsland,” Mr Chester said. “Already the business, operated by two generations of the Olarenshaw family, has increased production volumes five-fold in the past five years. Luke Olarenshaw who owns the business with his parents and wife Angela, said construction of the new post peeling facility was a $1.25 million project and would create 20 construction jobs and four ongoing positions. “The new steam cylinder has arrived on site. Moving forward, we need to install and commission the cylinder and build a new shed for extra storage of our steamed product. After that, works on the new post peeling mill will start. We already have some of the new milling equipment built and on site. “We expect the post peeling facility to be operational by June 2020.